In spite of being indisposed, Pradeep has sent us this list..Thanks Pradeep from all of us and get well soon ! Conditions for Monsoon withdrawal are in place for the areas as marked in Blue, and Vagaries withdraws SWM from this Blue region (as per Old Map reproduced again for easy reference)...and collaborating with the IMD sat image of Thursday evening. IMD will withdraw the Monsoon from these regions after 3 days, as per their rainfall parameters..
Mumbai Lakes Storage Position as on 10th October 2012: On Mumbai Page for those Interested..
Mumbai Scruz: 1867 mms and 168 mms. Panvel: 2196 mms and 178 mms. Vasai: 1553 mms and 23 mms. Matheran: 3379 mms and 168 mms. Pune: 377 mms and 119 mms. Mumbai City: Clear skies with day temperatures rising to 34/35c. Nights till mid October will hover around 23/24c (Scruz), with the day possibly touching 36c on the odd day. Daytime humidity can fall to 35% next 3/4 days. Outer Townships (around Mumbai) will be warm in the day, 34/35c and night will be around 22c till mid October. Pune and Nasik drop to 15/16c after 18th. UAC over the Southern tip of the Indian Peninsula has moved over Kerala and adjoining TN, causing good precipitation over Kerala on Thursday itself. A WD, O-1, with extended trough will cross eastwards from Pakistan thru Northern India from the 16th October. Rains will be moderate in Extreme North Pakistan. On the 16th and 17th of October, Northern Indian states of Kashmir and HP will get some rains, with snow in the medium ranges. (Gulmarg/Pahalgam may get first snowfall). Both Punjabs will get light rains on the 16th October. Cloudy weather in Delhi on 16th and 17th.the nights will drop to below 15c in the NCR after the 18th of October, once the cloudiness clears. As the Southern UAC weakens, we see a change of wind direction to NE over Chennai region from 15th/16th October. The final withdrawal of SWM from Southern most India, and the NEM setting, may happen between 16th and 20th October. @ Rajesh Sir. Also publish Matheran Hill station rain figures from 1st June to 30th Sept 2012 period which is normal SWM period. And also if figures available from 1st Oct till 11 Oct 2012 period. Some winter experience started to feel over some part of Maharashtra now . Today min temp of Nashik was 17 C and Amravati was also at 17 C today morning. Pune was 20 C.
Thane temperature even now at 10pm hovering around 29-30 C. Yesterday around this time was lower at about 27-28 C. Probably due to the after effects of the thundershower. Today is the first day when no visible signs of any clouds that might cause rain atleast till the evening. Additionally wild swing seen in the humidity levels also. Today after 8pm in Badlapur some chill or cool weather is felt. There is no wind or breeze but some chill coming from north direction. What exact word is there for that I don't know ! But when we stand on terrace some cool/chill can be felt.. So whether and indication of winter are setting in !! Now have to see in morning how much further dip in temp is noted here ! Already 24.5 C at moment here. @GSB nd Abhijit,,,,weather in panvel has turned cool,,but ther was considerable flip flop in humidity levels!finally guys our favorite season is over,,GSB luking forward to ur poem on the dry october heat!! Abhijit, maybe 'nippy' is the word you were trying to use..
Junaid, if the October nighttime temperature touches 32/33 with a humidity of more than 80% and maybe with the AC off I might just write one ...by the way that was my first attemp at poetry ... thanks to VAGARIES... LOL !! sangameshwar got 67 cm during 11 days of oct wich pune dnt manage to get in the entire swm! !an irony indeed! Today Badlapur noticed dip in min temp. So experienced first chilly day of this winter season. Today min temp is 21 C here in Badlapur. Yesterday it was 24 C . So today drop by 3 C. So as soon as monsoon withdraws drop in min temp noticed. Today its very deep blue sky and no fog at all. So clear visibility too here in Badlapur. Even in a poor monsoon year, mumbai rains around 200 cms. Wow! thats cool. Hope to god next year is even better. Even in weak monsoon mumbai crossed 2000mm mark in (santacruz), thats really good .next years monsoon i hope is really good.crosses 3000mm . Sangameshwars 1 weeks rains are more then delhi's entire 4 months rains. Abhijit, the temp low was 23.5 c at Thane at 6.30am today morning. Now it is at 32.5 c a jump of 9 c in five hours !! The humidity too has fallen in the same period from 80% to 50%. Wild swings indeed as soon as the monsoon is over !! This to inform readers, that though our friend Pradeep is indisposed, he has very kindly agreed to various requests from vagaries readers to prepare the toppers from Maharashtra, at least..he has personally informed me of this, and has promised to get the toppers ready by Friday afternoon. The Amboli figure is missing, and i am helping out to get that for him. Vagaries wishes him a speedy recovery and best of health...we all send him a "get well" message..
Mumbai at 12 noon: scuz 34c, humidity 36% wind E. vagaries 33.6c, humidity 51%...we had mentioned yesterday the "odd day" before mid October will rise to 36c....is the "odd day" today itself ? waiting for the sea breeze..
Eerie weather in bangalore. Its dark and windless. Typical october weather. North TN, North Interior TN and South Interior Karnataka is in for deluge today. @GSB, in low humidity conditions you will typically see large temperature swings (assuming neutral weather conditions) - you would have read that in Deserts (very low humidity) the days can be blazing hot - touching 45 degrees celcius but nights can be chilly dropping to freezing temperatures, a massive swing. @Pradeep, I echo Rajeshbhai's comments, wishing you a speedy recovery. Pradeep get well soon,,wish u a speedy recovery!! IMD echos vagaries' WD and Monsoon withdrawal, announcing in Fridays evening report..
Now the weather in Delhi-NCR is cooling down a bit.Maximum in 32-34c range and low in 18-19c range.Eagerly looking for the upcoming WD but i know it won't pour over Delhi-NCR. Hats off. Even IMD is also recognizing you. Here in south [at least among weather enthusiasts]you have become an icon. Congrats. Further when interacted with eminent meteorologist here I was given to understand that the deficiency in South TN is due to SWM wind concentration only on and above PBL level i.e above 2000m. They are of the opinion that VSCS "THANE" was a indicator or precursor for this SWM2012. This idea I want to share with you. May be myself incorrect. Looks like many top slots as published by Rajesh/Pradeep Sir are from MAHARASHTRA. KOLHAPUR districts comes with surprise. This may be due to Madhya MAHA receiving heavy rains in latter half. Bangalore oct- NO RAIN. Like MAHA does KAR receive re-treating monsoon thunders. All MAHA heavy weights are in short of approx 1000mm - for 8000mm as happened during 2011. Not sure if anyone else has noticed. 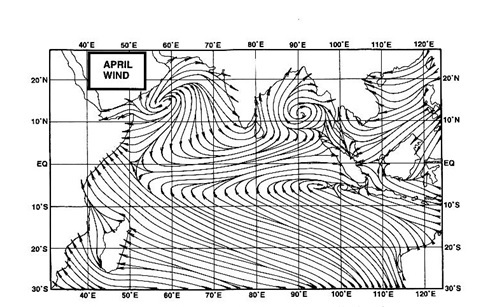 Southern Indian ocean is showing a clockwise swirl. Cyclonic depression? This may be bad for water starved TN/KAR.If it goes west hitting OMAN/SAUDI. This peculiar pattern was noticed last year also multiple occassions. 1. South India - decreasing rains. Worst spots being south east interior India. 2. 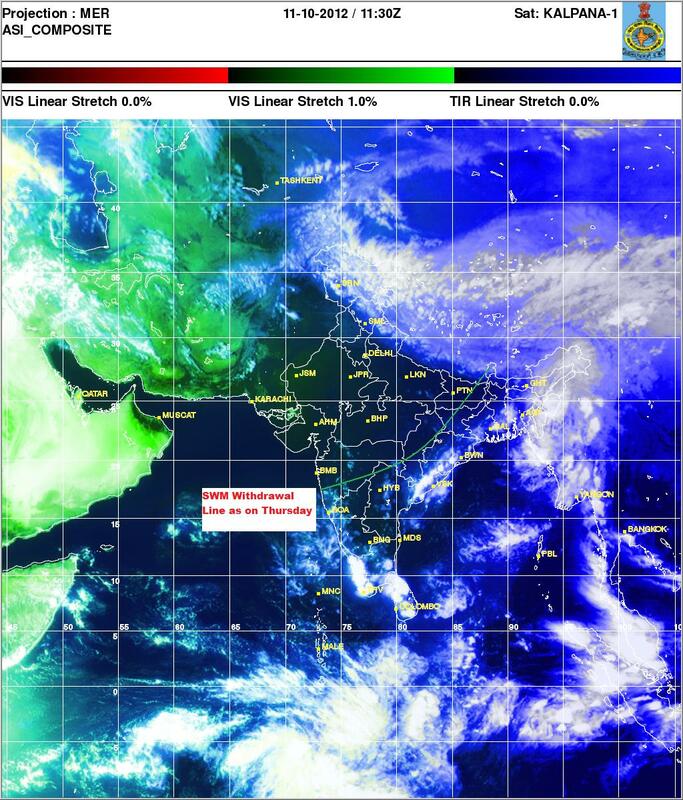 Central India-MAHA,GUJ,RAJ increasing rains. 3. NEM currents moving as depressions over Saudi- drought for TN.